Technically, any excess body fat you see building up below the belt isn't because of specific foods that go to your thighs. Instead, it shows up because you're consuming too many calories for your current activity level. With that said, there are definitely a few food habits that can help or hurt your quest for slim thighs and a few fitness tricks that can boost you along toward your goal. Consuming too much of any food or consuming more calories than your body burns can add fat anywhere on your body, including your thighs. Fight back by focusing on eating high-quality, nutrient-rich foods and consider adding some extra physical activity into your daily routine. If you feel like you're carrying some extra weight in your thighs, the key to losing body fat is not dieting, which for most people means taking yourself down to starvation levels of calories. While that might make some weight come off in the short term, in the long run, that weight usually comes back. Some people even boomerang to a higher weight than they started at, as unhealthy diet habits reassert themselves with a vengeance. As one example, a Drexel University study reported in a 2017 issue of the journal Obesity found that more drastic fluctuations in weight loss early on were a predictor for poorer long-term outcomes. 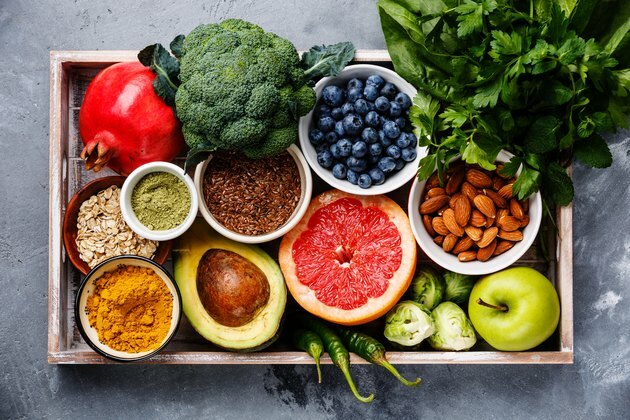 Instead of "dieting," shift your focus to a healthy habit you can sustain (and enjoy) for the rest of your life: eating high-quality, nutrient-rich foods. Focus on eating lots of brightly colored vegetables and fruits, whole grains, fat-free or low-fat dairy, high-quality lean proteins, and healthy fats from sources like nuts, healthy oils and fish. Stay away from highly processed foods, foods rich in saturated fats and trans fats, foods with added sugar and foods with added sodium. So if you're not supposed to starve yourself, how many calories do you need to stay healthy but still reduce thigh fat? The exact number depends on a number of factors, including your body composition (what percentage of your body is muscle versus fat), age, gender and physical activity level. The U.S. Department of Health and Human Services Dietary Guidelines for Americans, 2015-2020, gives you a good estimate to start from, broken down by age, gender and activity level. For example, a sedentary 30-year-old woman typically needs only 1,800 calories a day to stay healthy, while if she's active, she needs about 2,400 calories. A sedentary 40-year-old man typically needs 2,400 calories a day, whereas if he's active, he's estimated to need 2,800 calories a day. Processed foods, saturated fats, trans fats, added sugar and added sodium are all sneaky. They find their way into all sorts of unexpected foods in the grocery store. One of the easiest ways to avoid them is by shopping around the perimeter of the grocery store, which is where you'll usually find the fresh fruits and vegetables. If you buy anything in a box, get used to looking at the list of ingredients and the nutrient label before you put it in your cart. The shorter the list of ingredients, the less processed it is. If you see anything on the list that you don't recognize as an actual food item, put it back on the shelf. Get less than 10 percent of your daily calories from added sugar. Get less than 10 percent of your daily calories from saturated fats. Limit your daily sodium intake to less than 2,300 mg. The same guidelines also recommend moderating your alcohol intake to no more than one drink per day for women and two drinks per day for men. If you're really serious about slimming your thighs, though, consider giving the alcohol up entirely, at least for a while. You might be shocked by how many calories are in your favorite alcoholic drinks: A single 12-ounce beer can easily top 150 calories, while many wines pack 100 calories or more per glass. If you have a farmers market in your area, try shopping there. The fruits and vegetables are usually fresher than anything you can get in the store, and the farmers can tell you exactly how to prepare any produce items that are new to you. Some farmers markets accept WIC, food stamps and other aid programs. While diet alone can help you lose weight, 94 percent of the participants in the National Weight Control Registry, a long-term effort to track how people lose weight and keep it off, reported that increasing their physical activity helped them lose weight. That doesn't have to mean expensive gym memberships or high-drama workouts. According to the registry, the most frequently reported form of exercise the participants used was walking. With that said, whether you're walking, lifting weights, getting down on the dance floor or cranking away in a group cycling class, the more physical activity you get in, the faster any extra weight will come off. Cardio exercises like walking, running, dancing, swimming and bicycling get lots of love for weight loss and with good reason — because they're very effective. But strength training is useful too. Not only does it burn calories while you're lifting, but it also helps you build lean muscle, which will give your thighs a pleasing shape as excess fat slips away. That lean muscle mass is four times more metabolically active than fat, so it burns more calories even when you're not working out. Heads up: Although exercise can help sculpt muscle and melt away excess body fat, you can't target your weight loss efforts at a specific area of your body. That idea, called spot reduction, is nothing but a myth. How fat comes off your body is determined by a number of factors, including genetics, hormone levels and age. But even if you find that fat lingers on your thighs, it will come off if you maintain your healthy new diet and activity habits. Once you decide you want to take steps to lose weight in your thighs, you might understandably want the fastest results possible. But the Centers for Disease Control and Prevention cautions that people who lose weight at a gradual rate of 1 to 2 pounds per week will have better success at keeping the weight off. Even though losing the weight gradually may not be as exciting as seeing the number on the scale drop quickly, keeping the weight off in the long-term is immensely satisfying. Look at it this way: Every single minute of exercise, and every single healthy food you put in your body, is another step closer to a long-term victory that nobody can take away from you.